Figure 7-19 Long-term trends in population estimates of adult American shad in the Delaware estuary. Source: Santoro, 1998.
provements in water quality conditions, the spawning area used by shad has increased by 100 miles in the estuary (Albert, 1997). Annual shad festivals are now celebrated in the spring along the Delaware River, and the recreational shad fishery is considered to be a multimillion-dollar industry (Frithsen et al., 1991). As a result of water pollution control efforts and a well-regulated fishery, populations of striped bass in the Delaware River are also showing evidence of a resurgence of once-depleted populations (Santoro, 1998). 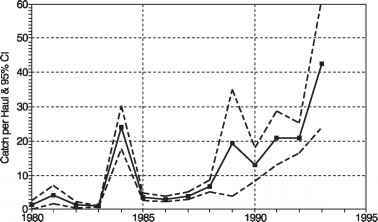 Assessments of commercial harvest statistics for American shad (Figure 7-20), striped bass (Figure 7-21), and white perch (Figure 7-22) clearly document significant increases in the catch-per-unit effort of these species from 1985 to 1993, correlated with improvements in water quality (Weisberg et al., 1996). Trends in catch efficiency are also reported by Weisberg et al. (1996) for blueback herring and alewives. Studies of the distribution and abundance of the shortnose sturgeon, listed as an endangered species (Price et al., 1988), suggest that populations may be recovering from the historical decimation of this species during the twentieth century, a decimation resulting from water pollution and overfishing (Frithsen et al., 1991). Figure 7-20 Trends in catch efficiency (mean ± 95% confidence interval) for American shad in the Delaware estuary. 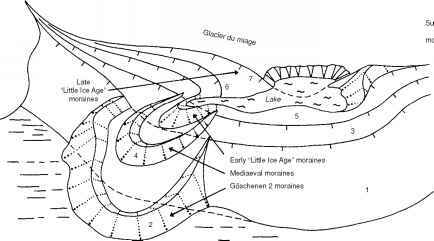 Source: Weisberg et al., 1996.